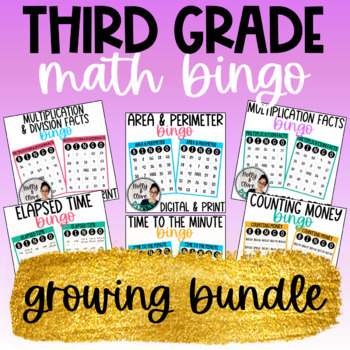 This product includes six math BINGO games that are perfect for practice and review! There are digital (Google Slides) and print versions for every game. Get your students ready for the state test by helping them to master important 3rd grade math skills - all while having fun! it would cost $20 to buy all six games at full price. Grab the bundle and SAVE 25%! What does "growing bundle" mean? A growing bundle is a bundle that is not yet complete. Each time I add a new game to the bundle, the price of the bundle will increase. That's why it's a good idea to buy into a growing bundle early, so you get the best price! Once you purchase this growing bundle, you will receive the rest of the games for free! Have a suggestion for a BINGO game? Would you like a custom bundle? Do you have any questions or concerns? I would love to hear from you! Thank you for considering this growing bundle!